Barton Swing Aqueduct looking east from the road swing bridge. Four miles west of Manchester, between Stretford and Worsley, is one of the wonders of the waterway world - the Barton Swing Aqueduct, carrying the Bridgewater Canal across the Manchester Ship Canal. This route of the Bridgewater Canal between the coal mines at Worsley and the centre of Manchester needed no locks but involved the construction in 1761 of an aqueduct across the River Irwell at Barton (which was, at that time, part of the Mersey and Irwell Navigation). No aqueduct on this scale had previously been constructed in England and critics thought it would never hold water. The canal was carried on high embankments and across the river, 38 feet below, on three sandstone arches. 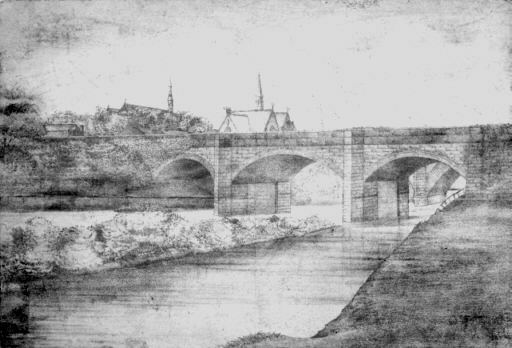 Drawing of the original Barton Aqueduct, by Richard Bagot, with Barton Bridge and churches behind. This is looking from the original Barton Lock, built alongside a weir. The River Irwell flows from the weir into the left arches while a separate navigation channel runs from the lock to the right-hand arch. In 1885, both the Mersey and Irwell navigation and the Bridgewater Canal were bought by the Manchester Ship Canal Company. 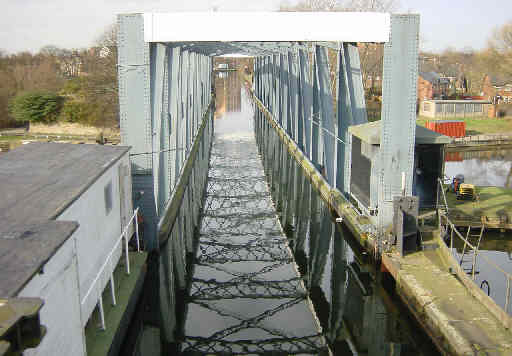 Much of the Mersey and Irwell was incorporated into the Ship Canal but, to enable the much larger vessels to pass below the Bridgewater Canal, the historic landmark of Barton Aqueduct had to be demolished. It was replaced by a unique swing aqueduct that was opened in 1893 and was an even more daring structure than the original aqueduct, consisting of a channel that could be sealed off at each end to form a 235 feet long and 18 feet wide tank, holding 800 tons of water, that swung round on its pivot, situated on an island in the middle of the Ship Canal. 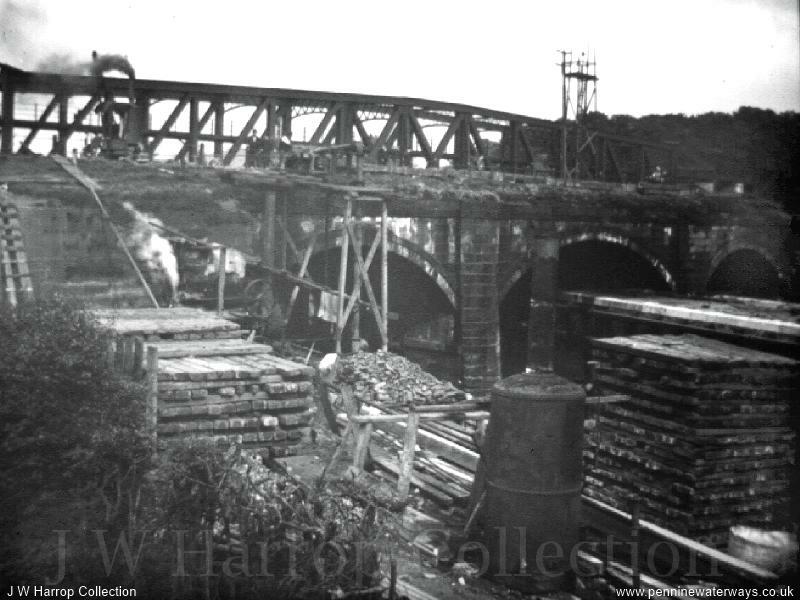 The Barton Swing Aqueduct under construction in the background with Brindley's original stone aqueduct in front. The swing aqueduct was built alongside the original stone aqueduct (see above photo) so it was impossible to test whether it worked by swinging it open with a tankful of water until the original aqueduct had been demolished! However, the faith in the designers and engineers was well placed and the aqueduct has been swinging successfully ever since. 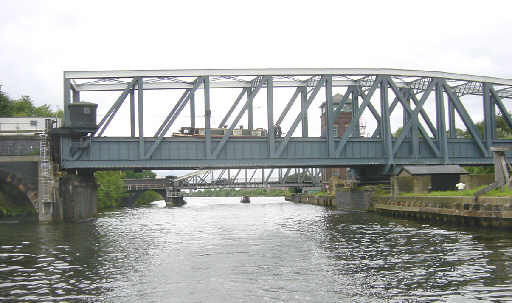 The Barton Swing Aqueduct seen from the Bridgewater Canal, looking south. Barton Swing Aqueduct looking north along the navigation channel. 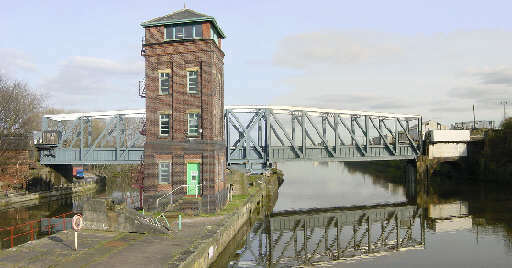 Panoramic view of the Barton Swing Aqueduct, road swing bridge and control tower. Both bridges are operated from the control room at the top of the tower. The Manchester Ship Canal, itself a waterways wonder, opened in 1894 and allowed ships of up to 400 tons to reach docks close to the centres of Salford and Manchester. 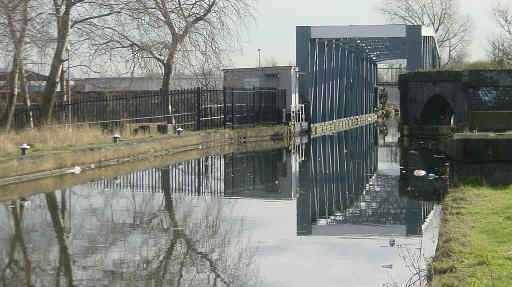 A boat passes across Barton Swing Aqueduct, seen from a boat on the Ship Canal. Archive photos including the original stone aqueduct.